Check out the Miss Rumphius Effect "Monday poetry stretch" for this week. I had quite a bit of fun with it, but, since it had funky formatting, I had to scan it and post here as an image. I like your concrete "what isn't there" poem. 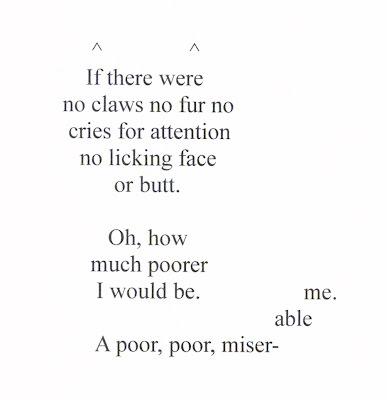 I need to become more technically adept so I can try my hand putting concrete poems on my blog. BTW, I'm a cat lover myself. I'm not technically adept, I just knew I couldn't get the formatting right in the blog (it's sometimes impossible to even get a double space without putting in code to do it). Take your original document and scan it. (I had to go to the library to do it since I don't have a scanner, but lucky for me, I work at a library!) When it comes time to save it, save it in pdf format and then you can simply post it as a photo.